Click to embrace the video madcappery. 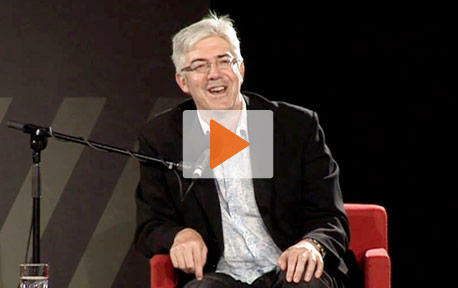 Shaun Micallef isn’t quite Aussie comedy gold. He’s too obscure for that. Take his latest novel - a time-travelling example of what he calls “com lit” with tongue firmly planted in his cheek. Even interviewer Doug McLeod needs to have the story explained to him as Micallef quips that his book is as important as the Guttenberg Bible - “by which I mean the Steve Guttenberg Bible that came out to publicise Police Academy”. And as for the reading, Micallef gives us a kooky excerpt in which bestselling author Matthew Reilly is beaten up by French singer Charles Aznavour for the Australian author’s crimes against French libraries. This is pure comedy kryptonite, the perfect panacea for shabby stand-ups.